The following section is not a blow-by-blow account of the construction techniques utilised in the production of the Meare Heath Bow replica, but rather a brief outline of the manufacturing process along with an account of what was actually discovered during the making of the bow. The flint tools employed in the manufacture of the bow were 4 burins, 1 waisted tool, 1 small axe/chisel, 3 knives, 3 hollow scrapers (spokeshaves), 2 end scrapers, 1 convex scraper and 1 Y-shaped tool (small hand axe). The flint tools (faithful reproductions of Neolithic tools) were made by Martin Green. As discussed above, the original bow was likely cut from the trunk of a yew tree 80-100 years old. Once a decent trunk had been acquired (Fig. 2), the first stage of the manufacturing process involved splitting the log down into staves and selecting the best stave for the job (Fig. 3). This done, the stave was roughed out into the correct shape using a flint axe. It was immediately noted that the underside of the stave, which was to form the belly of the bow, was covered in shakes (small cracks running the length of the wood), whilst on the upper face or back of the stave there was a huge knot. The first interesting point noted about the bow when the manufacturing process began was that the Neolithic bowyer had not allowed for any excess wood around knots on the original bow. It is usual practise among bowyers to leave a millimetre or so around a knot to strengthen an otherwise weak area; this was not done on the Meare Heath Bow. The lack of raised wood noted, it was decided to ignore the rule about leaving excess wood around knots during the making of the replica, and to rely instead upon the original bowyers design skills. Fig.1 – The Meare Heath Bow: (bottom) the remains of the bow; (top) a reconstruction drawing showing how the bow may have looked. Fig. 2 – The yew log, comprising the trunk of a reasonably young yew tree 80 to 100 years old. Fig. 3 – The yew log split. The splitting was undertaken using wooden wedges. Once the stave was split roughly to size, the side that was to form the back of the bow was rounded off using flint knives and long burins as drawknives. It took very little time to rough out the bow’s shape quickly and effectively. The stave was then shaved to the correct thickness by taking wood off of the side that was to form the belly of the bow, again using the flint knives. 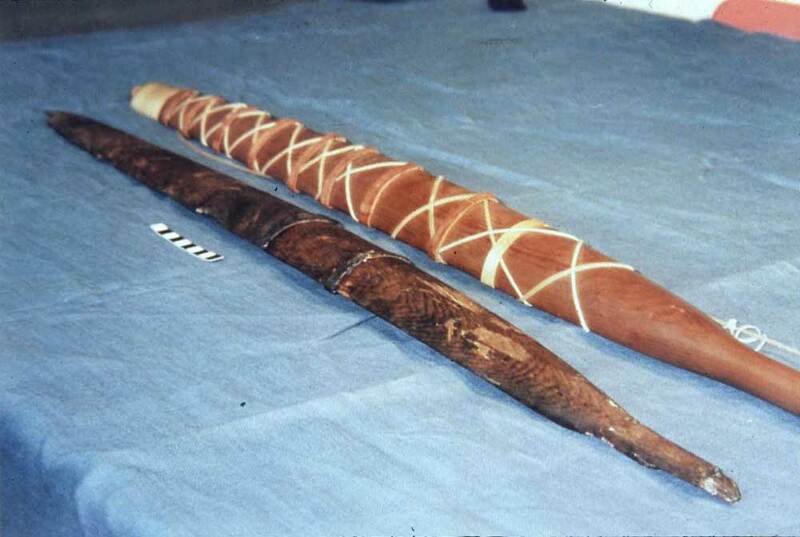 Then a long burin was used as a drawknife to get the staves width, along its entire length, correct (Fig. 4). The final shaping of the back of the stave was then carried out using the long burin to slowly cut out and shape the convex face. The stave at this point was starting to flex very well. As the work progressed, an interesting fact was noted in connection with the flint tools. Due to the hardness of the yew, the tools naturally left a raised area of wood around the knots. This, as mentioned above, would be an advantage for the bowyer, as it would mean that an area of natural weakness would be strengthened due to the excess wood left behind around the knots. The Meare Heath bow however, has no raised areas of wood around its knots, so it has to be assumed that all of the wood around the knots on the original bow was removed on purpose and with considerable effort. Was the shape and finish of the bow more important than the bow actually being strong enough to work? Once the shaping of the back of the stave was complete, sandstone was used to sand out most of the tool marks (Fig. 5). The next stage was to shape the handle on the belly side of the stave. For this job, the flint end scrapers and spokeshaves were utilised. The stave had now reached a point where it could be gently flexed in order to detect any possible areas of weakness; three areas were immediately identified. The weak areas were, one in what was to be the lower limb of the bow (around the large knot) and another two either side of the handle section. These weaknesses although a problem led to some major discoveries about the bow. Fig. 4 – Drawing down the timber using reconstructed Neolithic flint tools. Fig. 5 – Sanding down the bow using sandstone. Fig. 6 – Carving the nocks. The stave selected to make the replica was the one that was best suited to the job: in other words, the stave that was thought to most closely resemble the one from which the original bow was shaped. As it turned out the match in the handle section of the bow, right down to the grain, was probably about as perfect as could ever be obtained. As with the original bow there were knots on either side of the handle section on the replica, where the heartwood of the tree runs in and out of the stave at this point. Added to which, these knots had bad shakes connected with them (this is where the original bow actually broke). What was then realised was that the break that would occur in the replica bow, if the faults were left unchecked, is not the break that seems to have occurred in the original bow, even though the grain patterns and faults are virtually identical. To get the replica bow to break like the original (i.e. with the grain opening up on the belly of the bow), the bow would have to be flexed the wrong way! So what had happened to the original bow? To get the replica to break like the original it would have to be placed back first against a hard object, like over one’s knee, and snapped – the bow’s back literally being deliberately broken. Could it be then that the bow was made, used for a while and then unstrung, turned over and purposely broken? If the original fragment is studied, there is even potential visible evidence for a deliberate cut mark into the handle. Could this score mark have been made with a flint tool to make sure that the bow broke? What is perhaps being recorded here is physical evidence for a deliberate offering or ‘ritual killing’ of the weapon. It seems likely that the Neolithic Meare Heath Bow was intentionally broken and thrown into the marshes of Somerset, presumably as some kind of votive deposit. The other problem mentioned above was a knot in the lower limb, which was beginning to split open. This knot was a major problem, as a weakness such as this in the limb area of the bow could cause it to break. How could this weakness and the ones near the handle be overcome? Looking at the original fragment the answer became apparent. It was decided that bands of soaked rawhide could be stitched in place, whilst wet, around the limbs and allowed to dry, thus shrinking to form a strong bond around the bow, binding the faults tightly and preventing them from opening up. This was tried and found to work perfectly. It seems highly likely that this is the origin of the transverse leather bands placed next to the wood. The bands were used almost like ‘sticky tape’ to hold faults in check, preventing the bow from breaking. The Neolithic bowyer probably encountered similar problems and came up with an identical solution. Fig. 7 – Tillering the bow. Fig. 8 – The first draw! Fig. 9 – The reconstructed bow next to the original fragment (Tip). The faults dealt with, work began on the nocks. A flint knife was used to slowly pare away the wood either side of the nocks for the attachment of the bowstring (Fig. 6). It was discovered at this point that one of the knives, through use, had developed a serrated edge, this was found to make an excellent saw for cutting the shoulders of the bow. A convex scraper was then employed to remove most of the tool marks and blemishes. This done, the stave was given a quick sand over, again using sandstone. It was then time to put a string on the stave and place it on the tiller. This was a worrying moment! Had our suppositions been correct? Would the stave flex enough to get it on the tiller or would it immediately snap in half? The stave was strung, placed on a tiller and drawn (Fig. 7). The stave actually formed a fairly good arc and did not break. There were two important points to note here, firstly how resilient yew actually is despite all the cracks, shakes and knots, and secondly the arc formed by the bow was almost perfect the first time on the tiller. It seems that the maker of this bow was an expert bowyer, a master of his craft. Having reached this stage in the manufacturing process it was felt that the following point could be justified: the bow could be cut straight out of the trunk of a fairly young yew tree, seemingly ignoring many of the usual considerations of bowmaking, but the result was still a near perfect bow. The bow was just a little stiff in the upper limb; however, a couple of hours of careful shaving of the wood in this area soon corrected the fault. Once the bow was tillered, it was time for the decisive moment, when the ideas and suppositions made about the bow would be proven right or wrong. The bow was strung to a reasonable bracing height and drawn. . . success! it did not break! (Fig. 8). It seems that all the preparatory work had paid off, the formula decided upon had been the correct one and a replica Meare Heath bow had been made. The first thing recorded was the bow’s poundage. For years, it had been believed that the bow would have a huge poundage, this however proved not to be the case. The bow was measured on bow-scales and came out at 42lbs (19kg) at 30″ (76.2cm). This is a reasonable poundage for a working bow, but it is not huge by any means. All that was now left to do was to sand the bow down and then put on the remaining leather and rawhide bands. A hard sandstone was used to take out all the tool-marks, then a softer one was used to remove the marks left by the hard sandstone. The webbing of rawhide and bands of leather were then applied. As the webbing was applied, the following points were noted. Firstly, the webbing helped to hold the bow together in case of breakage. Secondly, the webbing acted as a kind of shock absorber; the criss-cross rawhide strips helping to spread the load and stresses throughout the limbs like a damper when the bow was drawn. Thirdly, the webbing helped to silence the bow, which would have been invaluable when hunting with it. Fourthly, the webbing, when placed on the ends of the bow, gave the nocks and shoulders the suggestive appearance of the head and shoulders of a figure: a man with his arms tied at his sides (Fig. 9). Could this image of a figure have held some special significance for the bowyer? There are examples of ‘carved wooden figures and human representations that seem to belong to the period of bog burials, and deposits of weapons and other valuables’ (Coles J.M & B.J., 1989a), such as the ones from Aukamper Moor, Germany, or from Broddenbjerg, Demark (Ibid). There is even a wooden figure from Westhay, Somerset, Christened the ‘God-Dolly’, found only miles from the recovery site of the Meare Heath Bow (Coles J.M & B.J., 1989b). The bow is also of yew, which in itself has been considered a sacred tree in many societies (Philpot J.H., 1897), and bows in themselves have been revered as sacred objects (Piggot S., 1971; Gaunt G., 1997). The Meare Heath bow may not have been just a working bow, perhaps it was also an object of religious or ritual significance to the maker and the archer alike: a symbol of power and status in the society to which it belonged. The finished bow was taken first to The Roebuck Archery Centre at Gussage Saint Michael, Dorset. The final poundage of the finished bow was measured and found to be 42lbs at 28″. On the outdoor range, a dozen arrows were shot over 25m and every arrow hit the target! Two points were noted upon shooting the bow, firstly the criss-cross webbing acted as a shock absorber, making the bow almost silent, and secondly the bow was very quick. The bow was then taken into the field to try some distance shots. It was found that the bow was accurate up to about 100 yards (91.44m). It was capable of shooting an arrow further than this distance, but not accurately. Following these tests, the bow was taken to an archery equipment supplier: Quicks of Honiton. Here the bow was put through a chronograph. A chronograph measures the speed an arrow leaves the bow, which provides information about a bow’s efficiency. The faster the arrow leaves the bow, the more efficient that bow is. The Meare Heath bow tested at 43 metres per second velocity, shooting an arrow with the projectile weight of 30g. This is surprisingly fast given the poundage of the bow. A longbow whose draw weight measured 45lbs at 30″ shooting the same arrow (30g) averaged 34 metres per second. This means that the Meare Heath bow has a velocity advantage of 9 metres per second over a longbow of similar poundage. The Meare Heath bows – The original (left) and the reconstruction (right). 1. The bow was shaped ignoring many of the rules applied to the art of modern bowmaking, but still produced a very workable weapon. 2. The transverse leather bands were put onto the bow to hold faults in check, and strengthening weak spots around shakes and knots, which would otherwise have caused the bow to break. 3. The cross-webbing aids to protect the archer should the bow break, and acts as a shock absorber, helping to spread the load and stresses throughout the limbs, whilst additionally helping to silence the bow. 4. The binding at the bow’s tips, strengthen an otherwise weak area. 5. The bow took 49 man-hours to produce, although an experienced bowyer could probably have done the work in a third of the time pointing to a bow that can be fashioned from average timber in a fairly quick time. 6. The bow’s weight is 42lb’s (19kg) at 28″ (76.2cm). 8. Shooting an arrow with a projectile weight of 30g, the bow tested at 43 metres per second velocity. This was 9 metres per second faster than a longbow of similar poundage (45lb’s at 30″) shooting the same projectile (30g). 9. The creation of the replica helped to shed light upon the level of technology used in the creation of the original, which it turns out is a highly sophisticated weapon. The Meare Heath Bow actually accords with 20th (or perhaps now 21st!) century principles of scientific design and is a better weapon than the highly stacked medieval longbow that followed several thousand years later. This implies a considerable amount of thought and experiment on the part of the prehistoric bowyers. 10. The creation of the replica proved that Neolithic bowyers were skilled enough to know the best tree for the job, the best part of that tree, and the best way to treat the wood of that tree, in order to get the best results for bow manufacture. The Meare Heath bow is a fine example of the maximum utilisation of available raw materials to match the needs of the archer. In other words, the bowyer who constructed the original bow really knew how to get the best bow for his needs out of the materials available to him, with the minimum amount of effort. 11. In Neolithic Somerset, a hunter using the Meare Heath bow would have been able to kill a deer at 50 metres in just over a second. What is more, with the bow silenced (due to the cross webbing) if the archer missed the animal, and it did not see the arrow, he/she might even have been able to get off a second shot. 12. The disposal of the bow is perhaps the most interesting of all the facets of the bow’s history. It was thought for many years that the Meare Heath Bow had broken in use and had been thrown into the bog, perhaps by a disgruntled hunter. Careful scrutiny of the break in the handle points however to the bow being deliberately broken. It appears most likely that the bow was unstrung, the handle scored with a flint tool, the bow turned over and then snapped over something hard, like over one’s knee. Ritual deposition of votive artefacts/objects is a well-known practice the world over, and such deposits can be traced back thousands of years, so it is possible that the Meare Heath Bow was just such a deposit.